The SuperCPPS Fashion Festival has begun, and it also heavily incorporates Earth Day decorations, including the introduction of the Recycling Plant and also a scavenger hunt! Firstly, you will notice that there is a button on the top right of your screen, which allows you to take part in the Recycling Hunt! You simply need to click the item at their locations and once you find all eight, you will receive a pin. The first item is the teacup located at the Coffee Shop/Brownies at the top of a plant. The second item is located at the Pet Shop at the bottom left, beneath a skate. The third item is a barrel located at the Boardwalk/Beach and can be found in the middle of the grass. The fourth item is a Hot Sauce container. You need to click it behind the rock at the Dock twice. The fifth item, the java bag, is at the bottom left at the Cove. The sixth item, a newspaper, is at the top of the Ski Lodge, but you can find it at the Ski Village. The seventh item, which is a pizza box, is on a counter at the Pizza Parlour. The eighth and final item is next to the Mine and is a water container at the Mine Shack. Once you have collected all eight items, simply click the Recycling Bin on the top right of your screen and click “Claim Reward”. I accidentally did this on a Spanish server, but it’s the same on an English server! You will then be able to collect the Recycling Pin! Along with this, the usual pin has been hidden on the island! For the next two weeks, the Earth Heart pin is available at the Lodge Attic on a table on the left. Lastly, a globe hat can also be obtained for free by clicking the box available at the Mine Shack. Whilst that concludes the main activities of this event, you can also check out the new Recycling Plant from the Cove! It isn’t custom, but it’s still a neat addition to the island! If you enter the Recycling Plant on a Spanish server, you will also receive this medium-difficulty stamp! Sadly, you cannot enter in any Fashion Contests for this event, but there’s still several beautifully decorated rooms across the island, which I would recommend exploring! Furthermore, all donations made during this event will be given to protecting the animals, which is really cool! The next huge party will be in May, but I still really like this event! Thank you very much for reading, I hope that this guide helped! The Fashion Festival is due to be released on SuperCPPS very soon, and due to the delay, the team have released a code as well as two more sneak peeks! This is the first sneak peek which they published, and based on the event from classic Club Penguin, it seems very similar to the Snow Forts! Along with this, the SuperCPPS team released a smaller sneak peek of the Fashion Festival during the Town! In it, the Coffee Shop is decorated with glitter, and there are now purple walkways and banners. It’s been three years since we could last experience this event, so I’m really excited to see how it’ll be like, especially considering this is slightly unique as it is also a charity event! Hopefully it will be out soon. The Fashion Festival on SuperCPPS is a bit delayed, but is expected to release hopefully within a few hours! As a result, the team shared a small sneak peek of the design of the Fashion Festival, which looks absolutely beautiful! This was the photo which they released, which features part of a really cool design. I’m excited to see how this party will be like, especially since it’s a charity event similar to Coins for Change, which is really cool! 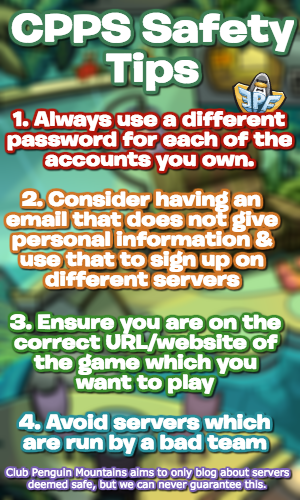 Be sure to check back for more of the latest SuperCPPS news and guides! The April 2018 SuperCatalog is now available, and it contains a new page filled with clothing for the Fashion Festival that begins this Friday! If you head to the Gift Shop, you should be able to see the new catalog. It didn’t work for me on an English server, but it did on a Spanish server, so try looking at the catalog there if it is also an issue for you. These are the new items and backgrounds all now available in the catalog! Thank you very much for reading, be sure to check back for more of the latest news and guides! Waddle on! The upcoming events for SuperCPPS have been revealed, including an announcement of the new party beginning this Friday! The Fashion Festival will be taking place, starting on April 13th, and DJ Fee will be the main mascot and host for this event. It will also be a “charity event”, meaning that it will be similar to Coins for Change, however the specifics are not exactly clear yet! 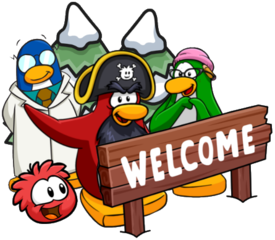 Along with this, there will be new furniture and music for igloos on April 20th, and also a new pin hidden on April 13th. I think it’s going to be really cool to see the Fashion Festival, especially since it will be a charity event!